Buy 8 Value 30" X 25' Gift Wrap get 1 free! 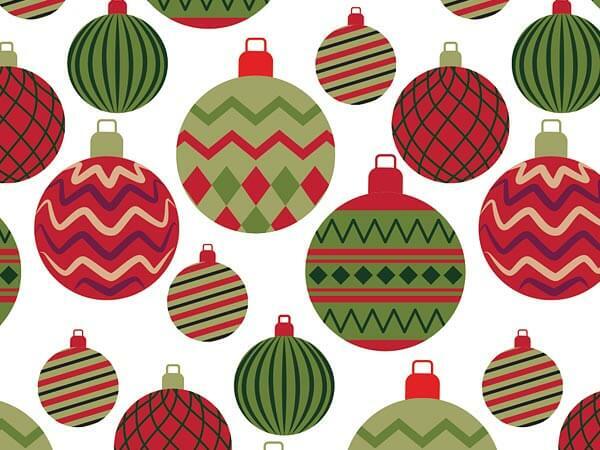 Red and green ornaments with fun prints on a white background. These small 30"x25' gift wrap rolls are perfect for both children and adult Christmas gifts and make the perfect addition to your supply of wrapping paper at home! Our wholesale prices make it affordable to stock up on multiple designs; choose 7 of these 25' rolls, and the 8th roll of your choice will be free! Made in the USA. Mix and match these designs to create your own perfect assortment! There are traditional Christmas and Holiday designs, as well as great everyday use designs for Birthdays and Celebrations! All gift wrap is printed on heavy weight paper which offers great coverage for your packages! Made in the USA!